If you’re looking for the best Buster’s Old Time Photo coupons, you’re in the right place! Buster’s Old Time Photos is a family owned business that takes pride in providing families with quality photos that will remain as an heirloom forever. They provide a great photo on the highest quality equipment and use the best photo paper, guaranteed to never fade. You will have a wonderful photo to pass down for generations. Buster’s is so thankful for their customers and they love to hear them say, “This has been our BEST experience yet”! If you’ve never had an old time photo taken, you may be missing out on the greatest vacation souvenir possible. Take home a lasting memory that you will be proud to hang on your wall. Buster’s will supply the amazing scenery, the cool costumes, plenty of props, you just supply yourself and the smile! 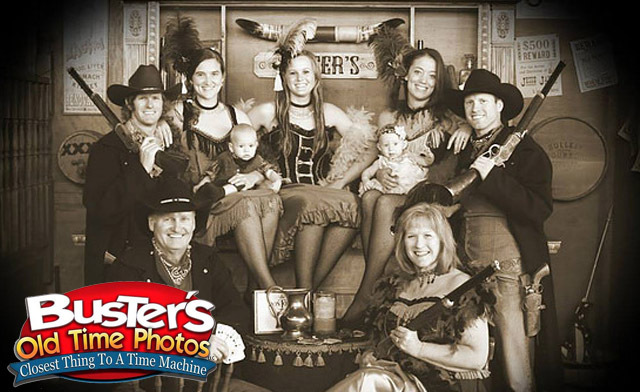 The Buster’s family will make your family feel right at home and help you get the most fun out of an Old Time Photo shoot! Go on in and see how much fun you have making great memories with a lasting photo!